Marlinspike provides a good reason to update iOS 4.3.5. A near decade old tool has been updated with man-in-the-middle attack capabilites that can intercept traffic from Apple iPhones. The attack tool sslsniff exploits a vulnerability disclosed by researchers Gregor Kopf and Paul Kehrer yesterday which allow traffic from iOS iPhones to be intercepted. Apple released fix iOS 4.3.5 yesterday to fix the flaw. The BasicContraints vulnerability affecting iPhones was first identified in 2002 by independent researcher Moxie Marlinspike who developed sslsniff to exploit the flaw. 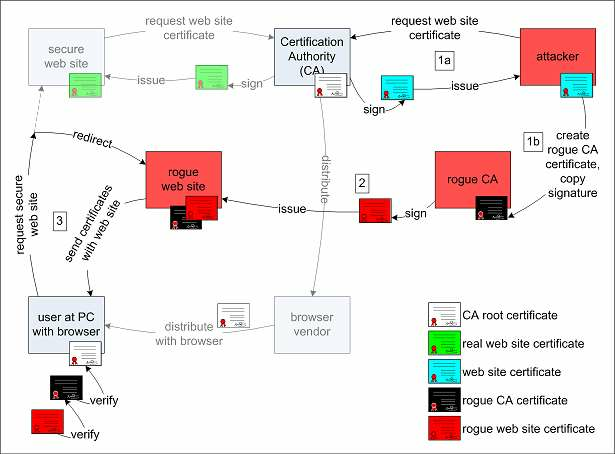 Back then, it was used to exploit certificate chain weaknesses (pdf) in Webkit browsers and Microsoft CryptoAPI, affecting the likes of Firefox, Internet Explorer, Pidgin, AIM and Microsoft Outlook. "It validated all the signatures in a certificate chain, but failed to check whether the intermediate certificates had a valid CA BasicConstraints extension se," Marlinspike said. "This meant that you could take any old CA-signed certificate and use it to sign any other certificate." The Linux-based sslsniff tool was updated with iOS fingerprinting support and can be downloaded here. Run (sslsniff -a -c -f ios -h -s -w iphone.log).